Alvaro Uribe needs to settle down comfortably into his velvety sitting room slippers, dedicate his time to critiquing leather-bound copies of political discourse, walking his dogs on the finca(s) and lending his valid opinion to the center pages of illustrious publications belonging to international right wing think tanks. This image, almost a pastoral one, of Colombia’s former president is about as realistic as cold fusion. The ex-president himself has displayed his reluctance to fade away into a John Major-esque existence of cucumber sandwiches, village cricket matches and lucrative public speaking engagements through his determined, often damaging and vitriolic outbursts over whatever media may lend him the soapbox. Often described as “bookish” in the international press, presumably due to his stature, economist’s build, statistician’s haircut, scholarly reading glasses and in that he couldn’t have been a farther cry from the supposed vanities and imagined joie de vivre so readily embraced by the boulevardier that was his predecessor Andres Pastrana, Alvaro Uribe changed Colombia. Wherever you find yourself politically, on the right or the left, you cannot dispute this last point. Colombia has been immeasurably improved by the double tenure (2002-2010) of Alvaro Uribe. But, just as a tide retreats after a storm, the flotsam and jetsam of human existence has also left behind the detritus of a politically stagnant mandate bereft of ideas. 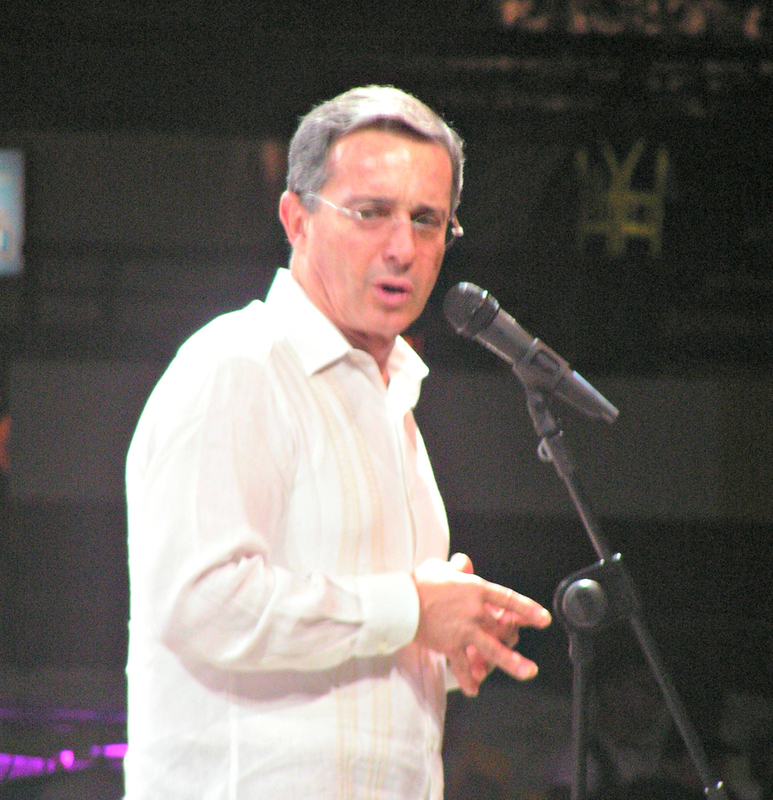 President Uribe’s time had expired long before the elections in which Juan Manuel Santos was swept into office. Accusations of links to paramilitary groups and drugs cartels, illegal wiretapping and the parapolitica scandal not to mention the notable disregard for human rights had all dented Uribe’s political machinery. While still popular at home in Colombia, his international prestige began to wane. Now, in this his most recent outburst (at the time of writing), to reveal on twitter (twitter! Where he has more than 2 million followers to his account) the infinitesimally delicate issue of the exact coordinates of the operation to transport several high ranking members of the FARC Guerrillas from the depths of Colombia’s jungles to Havana to partake in the peace dialogues, he has jeopardized further his role in the nation’s discourse. Even Uribistas question his credibility. Does Alvaro Uribe not wish for peace in Colombia? Of course he does. The weekly news magazine Semana has paraphrased sections of his memoirs “No Hay Causa Perdida” (No Lost Causes) in their edition 1615 where he clearly states that peace is his objective. Then why does he feel the need to be a spoiler of the current process? We can abide his vernacular referring to the FARC as “terrorists” and so on, as this has always been his wont. In fact, this is what we desire from Alvaro Uribe. We need him as a counterweight, as an unusual political bugbear on the right. But, if there is any advice that one can offer Mr. Uribe, it is that he needs to know when to reign in the bitterness as he is in dire risk of alienating his core supporter base and causing many to reassess their views and opinions of his noteworthy achievements. With reference to this last point, it is also incredibly timely to mention that Alvaro Uribe is not the only former president openly criticizing President Juan Manuel Santos. Uribe’s predecessor Andres Pastrana is also lining up to take lily-livered swipes as well. And while there is no doubting that Colombia would not have reached this phase of dialogues with the FARC were it not for the efforts of Pastrana in San Vicente del Caguan (1999-2002, and lest you forget, the FARC were winning the conflict at this stage) and the eight years of bombing runs employed by Alvaro Uribe, the commentary rings a familiar tune. There is, however, a grave difference between the elucidations of Pastrana and Uribe. Pastrana’s meandering folktales allude only to himself, and of course, this was his political line as well, while, Uribe seems out to destroy. There is a war of political vanities and legacies on the line and neither stands to benefit should this process for peace with the FARC result as successful. 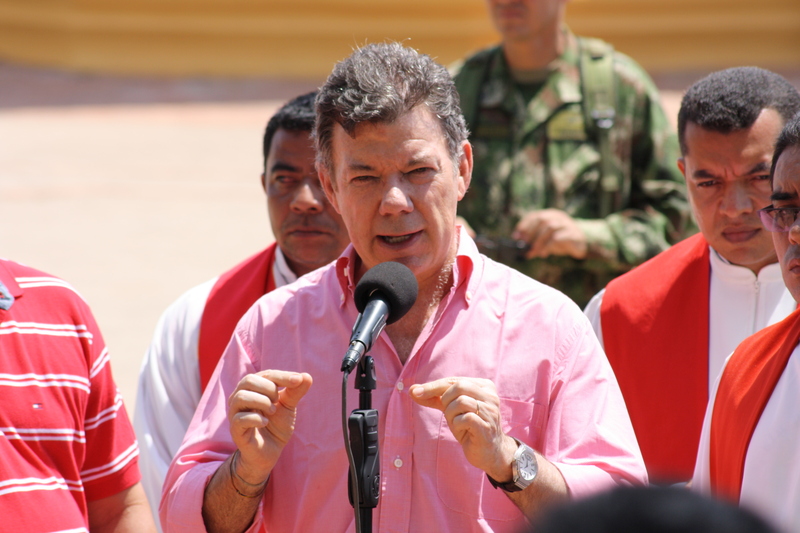 Said President Santos during the march for peace last week: “It’s normal that Colombians would be skeptical after so many deceptions. But the truth is the process is going well. “It’s a difficult and complex process,” he said, adding that peace could come in months if the current pace of talks is maintained. Enabling peace with the FARC is not peace in Colombia, we know this, but it’s a huge step in the right direction. We don’t want Uribe to be muzzled as his opinion and calumnious assessments are of huge importance. However, the former president must understand that the political landscape within Colombia has evolved beyond that of the period of his tenure. Colombia’s bookish former president has secured his ism, that of “uribismo” (the Colombian version of Thatcherism – and just as divisive) and must retire from the trenches as he is no longer suited to the needs of modern day political discourse. But, he must remain a vital part of the political landscape, and this is inescapable. Can we expect him to heed any levelheaded words of advice? This entry was posted in Journalism and tagged alvaro uribe, alvaro uribe + twitter, alvaro uribe velez, andres pastrana, FARC, Havana peace accords, juan manuel santos, no hay causa perdida, no lost causes, paramilitary links, parapolitica, political bugbear, revista semana, san vicente del caguan, thatcherism, uribe and cartels, uribe and paramilitaries, uribe leaking coordinates, uribe spoiler, uribe wiretapping, uribismo, uribista, wiretapping. Bookmark the permalink. Leftist insurgents and paramilitaries today work together peacefully in every area of rural Colombia as partners in crime. In crime, the ruthless and ambitious rise. To believe that young people brutalised in a life of drug-soaked crime from an early age are concerned about the cold-war narrative that obsesses journalists is fanciful. Neither is Uribe an ideologue, nor did he ever preside over Colombia, he could never afford either. He looks like a good employee because he is an employee. He works for the same sponsors today as he did yesterday. A more foolhardy journalist might do the obvious thing – investigate who today owns the lands stolen from campesinos allegedly killed or displaced by leftist insurgents; follow the money then fill in the politics. Very interesting insights, and yes, the journalist who does the investigation would be very foolhardy! The itching Uribe has to return to power means it´s very difficult to see him tucking into John Major´s cucumber sandwiches any time soon. Is his "ism" is here to stay? I think so – for the time being at least – but many argue that Colombia has moved on from Uribe. I don´t know… I think in urban Colombia this is true, but could the same be said for rural Colombia? Uribismo will have to prove that the caudillismo still functions without the caudillo. Thatcherism still exists even now she is gone; will Uribismo exist in 10 years? The choice of presidential candidate is vital, as is the formation of the senate list. Si salen quemados en 2014, de malas, pues. Very true, all your points, rural Colombia is far different from urban Colombia. Rather than cucumber sandwiches, could we edge Uribe more towards looking after his "paso fino" horses instead? Few days ago I've enjoyed a cucumber sandwiches first time. This sandwiches success to gives me a new knowledge about the sandwiches. I've already discussed this information with my friend their also very interesting about this sandwiches.